The rise of the ‘flying winemakers’ – consultants who travels the world to help clients improve their wines – was perhaps led by the Australians. In the 1990s, the Aussies were much in demand as wineries around the globe tapped into their knowledge, particularly of new technologies, in an effort to modernise and upgrade their wines. But today this breed of roving consultants is a global affair, and one country which has produced and embraced its fair share is Italy. Almost every Italian winery has a consultant working with them it seems, and a handful of home-grown names appear again and again. 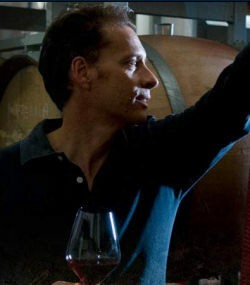 Having established his reputation at Frescobaldi and then as chief winemaker for Antinori in Chianti, Tuscan-born Alberto Antonini went on to do postgraduate research at the University of Bordeaux and then UC Davies in California, giving him the academic credentials to match his wine making experience. Whilst in California he worked with Robert Mondavi and Jim Clendenen at Au Bon Climat, and emerged with skills that married Old World and New, and which have made him much in demand. Today, Antonini has his own estate called Poggiotondo in Tuscany, and Greenstone Vineyards in Heathcote, Australia. But he also consults for a dozen international clients including Altos Las Hormigas in Argentina (in which he also has part ownership), Vesevo in Campania in southern Italy and the Cantine Leonardo Da Vinci cooperative in Chianti. Other projects take him to Chile, Uruguay, California, South Africa and Portugal in what must be a life of constant travel. This tasting brought together wines from various of Alberto Antonini’s estates and projects, all distributed in the UK by Liberty Wines. Retail prices are given in pounds sterling. This IGT wine from vineyards within the Chianti zone is bottled under screwcap and composed of Vermentino, Malvasia and Trebbiano, planted at high density and with yields kept low. It has a pale golden colour and a really bright, expressive nose, where delicately floral notes mingle with peach and lemon zest. On the palate there is real intensity here: the fruit has a sweetness, but also a decisive concentration that bursts onto the palate. It is medium-bodied, with that weight of fruit pushing through, and grippy, lemon and mineral acidity scythes through the finish with some authority. A very distinctive, expressive wine this and quite a mouthful with that notable intensity. 89/100. £8.99, see all stockists on wine-searcher.com. Another IGT wine, this one from Vesevo’s vineyards at 450 – 700 metres altitude in Campania in southern Italy. Soils contain a large amount of volcanic ash from nearby Mount Vesuvius (hence the name of the estate), and the wine is given a very cool ferment in stainless steel, with no malolactic fermentation. It has a clear, bright, apple fruitiness with little hints of honeysuckle and delicate sherbetty aromas. On the palate it is quite textural, with a weight of clean, ripe, juicy orchard fruits across the mid-palate, and a pretty, elegant length, where the acidity is clean, focused but gentle and the wine drifts into a long finish. 88/100. £10.99, see all stockists on wine-searcher.com. Antonini has been consulting at this Chianti Coop since 1996, working both with viticulturists and oenologists. There is 10% of Merlot joining the Sangiovese in the blend, as well as 5% of other grapes, and the wine is partly aged in new and one-year-old barrels. It has a pleasantly fruity nose, with some curranty undertones and a touch of tobacco to black fruits, and a little spice too. On the palate it is fresh and quite punchy: although there is a creaminess here, a nice firm edge adds some grip to the moderately long finish, supported by some mellow oak and spice. 87/100. £8.99, see all stockists on wine-searcher.com. This blend of Sangiovese with 10% Merlot was planted by Antonini in 2001, with the best available clones and a high-density planting regime. He is currently increasing the volume of Merlot, which thrives on the clay soils. The wine spends 12 months in French oak barriques, half of which are new. A subtle, complex nose hints at floral and spicy rose hip notes, with some cedary, smoky elements and plenty of bold black cherry fruit. On the palate this is medium-bodied and has lovely energy, the ripeness of that red fruit underpinned by a meaty, gamy layer and the spice coming through along with crisp acidity to lift and extend the finish. This is a dry, savoury wine, but one with a lovely sense of precision. 90/100. £11.99, see all stockists on wine-searcher.com. Antonini and friend Antonio Morescalchi visited Mendoza in 1995 and set up a group to buy these vineyards in Luján de Coyo, growing only Malbec. Parcels are vinified separately before blending and a short period of oak ageing. The nose has a spicy cherry fruitiness, with a just a little glimpse of Malbec’s more floral personality, and some more cedary, earthier notes. On the palate it has solid black fruit and a feeling of density: the tannins and the extraction on the palate give it a weighty but slightly indistinct character, with an enjoyably plummy, if slightly bruising quality. 87/100. £9.99, see all stockists on wine-searcher.com. Antonini co-owns this estate in Heathcote, Victoria, along with Australian partners. Sited 400 metres above sea level, 21 hectares are planted on volcanic soils of low vigour. Fermented with natural yeasts in open-top tanks, the wine was then aged 24 months in French oak, only 20% of which was new. There is a bold, rich, much more ripe and chocolaty expression of Sangiovese on the nose compared to the Poggiotondo. There’s a balsamic note, plush cherry fruit and plenty of vanilla and spice. On the palate that ripeness and sweetness is apparent, but there’s a sinewy, muscular core to this wine too, with firm but ripe and supple tannins and balanced acidity. Stylish and long, this is a delicious effort. 92/100. £26.99, see all stockists on wine-searcher.com.